I apologize in advance for what will probably be a light and fluffy week, blog-wise. We have three days left of summer, and I want to spend it helping my kids squeeze the ever-lovin’ daylight out of the remaining hours. Good for you! I pray that you enjoy these days!!! We are right there with you. I go back on Friday and then Dylan heads to first grade next Wednesday! Here’s to the end of summer vacation…YUCK! Oh poor kids – summer’s over! Here in Ontario, our kids go back after Labour day, Sept 4th – so we have another 3 weeks to go. I can’t believe school is starting so soon. I thought I was ready, but now am not so sure… I’ll be doing some squeezing-in-of-things the next few days, too! Wow that seems really early for us. Over here we don’t go back till 4th September. We’re only heading on our family holiday this Saturday. Yep, here in Texas we start next week….so I’m with ya. I am going to do a post in the next day or so of all the FREE, FREE, FREE office stuff I got from Office Depot’s big sale this weekend here in the Dallas area. Tons of stuff that will end up being for free. I like THAT kind of shopping! I will say that I am NOT ready for school to start back. I’m enjoying the summer way too much! My daughter starts 2nd grade on September 5th and my son starts preschool on the 10th, so we still have some time left, but we’ve already purchased backpacks and lunchboxes. That reminds me we have to go uniform and shoe shopping too, guess I’ll go do that. Ah, we are so in the midst of this. Best of luck to us all AND our children! 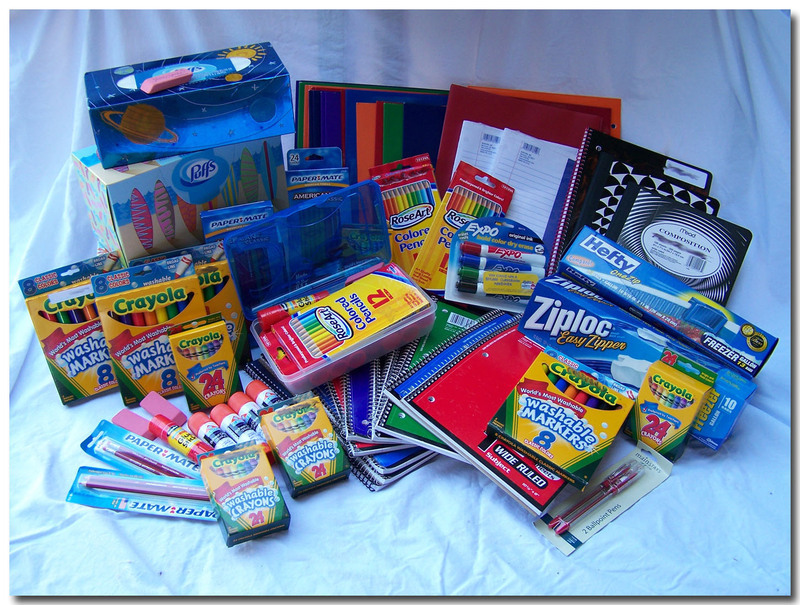 That’s an awful purty picture of school supplies, missy. You are like a purfessional.